Meteor Light heads to Warrnambool to represent the stable on Thursday. 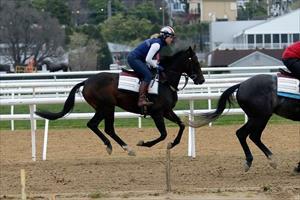 The import runs in race eight, the Benchmark 70 Handicap over 1700m with Craig Robertson to ride. Meteor Light disappointed at his latest start when finishing eighth over 2100m on a firmish track at Echuca which did not suit. It will be the fourth start in Australia for the five-year-old and Mike Moroney has made a gear change for the race. “He’s done well since his last start and trained on well,” Moroney said. “I’ve tweaked the gear a bit and put ear muffs on. “He raced in them in England so we will try those and see if he can relax a bit more. “The drop back in distance should not be a problem, especially as the track is pretty heavy. His has good form on that range of ground in England. “I’m going to ask Craig to try and give him a bit of room in the run if he can, I just wonder if he resented racing as tight as he did last start, bouncing off the rail a couple of times.